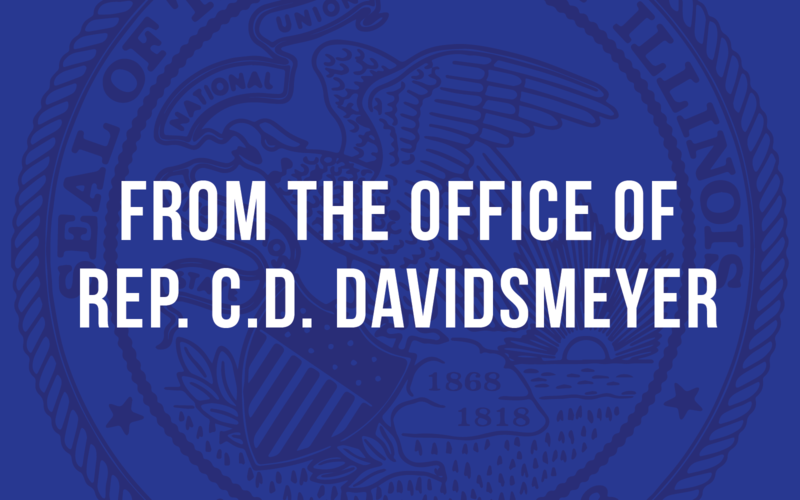 Jacksonville… State Rep. CD Davidsmeyer (R-Jacksonville) was appointed to be the Republican spokesman on two committees: the Energy Committee and the Special Committee on Youth & Young Adults. “I am excited to take a leadership role as spokesman on two committees and to serve on six more. While I am happy to be on each of these committees, I will continue to fight to decrease the excessive number of committees in the Illinois House. Like last year, I will be introducing legislation, HB 492, in this new General Assembly to reduce the number of committees to a maximum of 20, instead of the 50 we have this year. This will decrease at a small level the waste of tax dollars and provide time for each Representative to be more involved,” said Rep CD Davidsmeyer. State Representatives who are appointed as the Chairman or spokesman for any committee are given supplemental pay for assuming that leadership position. Republicans have long contended that these positions are just a way for the Speaker of the House to pay members of his caucus more money since several of committees never or rarely meet. “The U.S. House of Representatives, with 435 members, operates with basically half of the number of committees as the Illinois House, with 118 members,” said Rep. CD Davidsmeyer. “There is no need for seven types of education committees, seven variations of human service committees, or even multiple transportation committees. The issues don’t operate in a bubble, and therefore need to be discussed in relation to one another.” Rep. Davidsmeyer added.